The LGBT Helpline, the national support service for lesbian, gay, bisexual and transgender people, launched a guide to LGBT support services in Connaught at 11am today, Friday, 2nd December, at Teach Solais LGBT+ Resource Centre, Merchants Road, Galway. The guide was produced by the LGBT Helpline to provide practical information on a range of issues affecting LGBT people and their family members, including the supports available for them in the Connaught region. The guide is targeted at health professionals and others working with LGBT people. “One of the most common reasons why people contact our national Helpline is to find out about LGBT supports and social events in their local area. 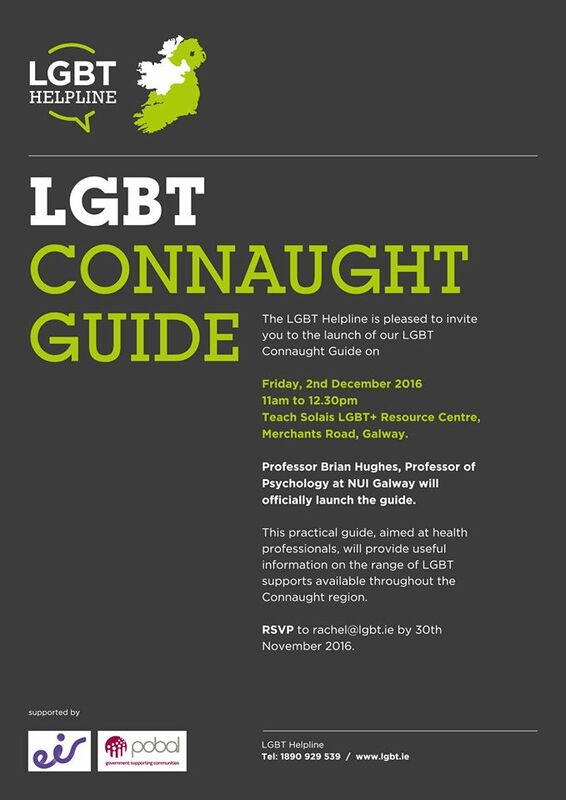 “The Connaught guide is intended as a practical resource for medical professionals and anyone working in support services for LGBT people. It will help them to quickly reference the services available in the various parts of Connaught, and to share information with those who need it. There are also chapters with information for: Family members of LGBT people, LGBT young people, and older LGBT people. The guide was officially launched by Brian Hughes, Professor of Psychology at NUI Galway, at today’s event. The national LGBT Helpline is run through a network of local helpline centres, including the LGBT Galway Helpline and the Outwest Gay Helpline in Mayo. The new LGBT Connaught Guide has been produced with support from the eir Fund – Connecting Communities. The Fund supports eir employees who work with community engagement projects and enables eir to do more to support charitable causes throughout Ireland. Over the past eight months, it has provided support to 12 registered charities, including the LGBT Helpline. “The support of the eir fund will have a significant impact on the services provided to LGBT people in the Connaught region. The LGBT Helpline is the national support service for LGBT people, their families and friends. It was established in 2010 and is run through a network of local helpline centres. The organisation’s teams of trained volunteers provide confidential support and information through the telephone helpline, online chat service, peer support service and the www.lgbt.ie website. The helpline number is 1890-929-539. For further information on the eir Fund, please email eirFund@eir.ie. Further information about the LGBT Helpline and the regional support services it provides is available at www.lgbt.ie. The helpline number is 1890-929-539 or log on to their webchat service.